A genuinely hip, thought-provoking work of art. It would be hard to imagine a documentary more prankishly enjoyable than Exit Through The Gift Shop. NYT Critics Pick 4/5 Stars Relentlessly entertaining! This is a doc you don't want to miss! un documentaire à ne pas manquer. Difficile dimaginer un documentaire plus jouissif! 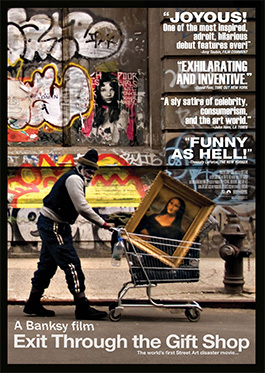 *Au cinéma en version anglaise uniquement* Exit Through the Gift Shop is the first film by the renowned graffiti artist Banksy.Banksy is a graffiti artist with a global reputation whose work can be seen on walls from post-hurricane New Orleans to the Palestinian segregation wall in the West Bank. Fiercely guarding his anonymity to avoid prosecution Banksy has so far resisted all attempts to be captured on film. Exit Through the Gift Shop is the story of how an eccentric French shop keeper turned documentary maker attempted to locate and befriend Banksy, only to have the artist turn the camera back on its owner with spectacular results. The film contains exclusive footage of Banksy, Shephard Fairey, Invader and many of the world's most infamous graffiti artists at work, on walls and in interview. The world's first street art disaster movie.